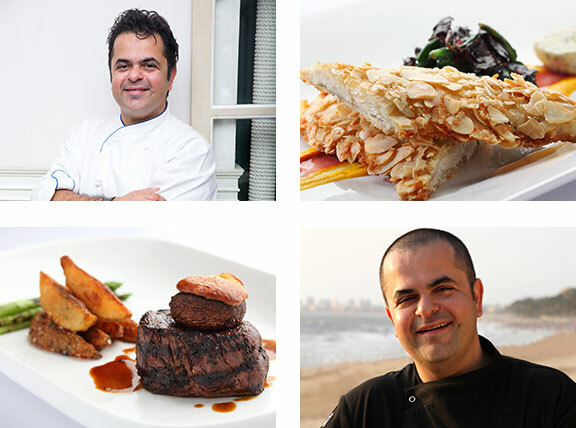 Chef Vicky Ratnani – the name sure does ring a bell, loud and clear! Even as a child, his love for food took him into corners of his home where children rarely venture, such as the kitchen! However, it was this very ‘wanderful’ attitude that led him to discover his passion for food. Soon after, Vicky emerged from his home in the leafy suburbs of Mumbai, graduated from the prestigious Dadar Catering College (Institute of Hotel Management, Mumbai) and set sail to pursue his dreams – quite literally! He gained a royal appointment aboard the Queen Elizabeth 2 (QE2), where he engaged with various global culinary traditions. After six world cruises that took him through many, many markets of the world along the way, Vicky went on to live and learn in Genoa, Italy. Among the many feathers in his cap, the one that stands out as the brightest is that of his achievement of being the Personal Chef to Mr. Nelson Mandela, on his journey from Durban to Cape Town while Mr. Mandela was promoting his charitable venture. Vicky’s finesse led him to leap into the lap of opportunity and be a part of the opening team for Queen Mary 2 (QM2). In preparation for this voyage, Vicky taught at the White Star Chef’s Training School on board QE2, in Manila and St. Nazaire, training over 180 chefs. Vicky also opened up the Britannia Restaurant & Kitchen – the largest restaurant at sea during its Inaugural Opening in 2004 and then progressed to the position of Executive Sous Chef of the QM2. Vicky then moved on to become Executive Chef for the Queen Victoria. As of 2010, he was the first and only Indian Executive Chef in the history of the Cunard Line. After moving back to Mumbai, Vicky took over Aurus. Docked by the sea, this was a haven for all food lovers who enjoyed good food and great global cuisines. Aurus was frequented by the city’s well-heeled and Vicky had all of them eating out of his hands! His menu was a reflection of quality produce and innovative technique with a cutting-edge method of food presentation. After Aurus, Vicky moved on to set up Nido, an all-day bistro in Mumbai. The menu here was a confluence of seasonal produce, old favourites, classic dishes, and modern progressive food. In 2014, Vicky joined EverStone Capital and revamped the brands under their belt. He was also responsible for tweaking flavours for Burger King India and working on new flavours for the Indian Market. In 2015, Vicky was voted Chef of the Year in India at the Indian Restaurant Awards. His restaurant in Mumbai called The Korner House by Chef Vicky won ‘Best Restaurant – European Cuisine’ at the 2017 Times Food Awards. Currently, Vicky consults as a Culinary Director with GIPL (a subsidiary of Bharti Airtel) and conceptualises restaurant menus and food concepts for places such as Pizza Express, The Runway Project, The Market Project, The Poona Project, Ministry of Crab and Nihonbashi. He is most recently revamped The Bandra Project, which is a communal style, casual-yet-chic, all-day eatery serving global cuisine. He also began a healthy food start-up called Hello Green, which has three back-end kitchens catering to South and North Mumbai. They serve healthy, organic, calorie- counted meals, as meal subscriptions or even à la carte at www.hellogreen.in. Vicky’s travels and his knowledge of global trends have led him to develop a web series called Vicky The Gastronaut, which is streaming on his Facebook page. The series has crossed over 10 million views. He has filmed in Peru and Australia, and is now filming the third part of the series at Chiang Mai in Thailand.